Jukebox Print card holders frame and fit your gift cards, business cards, coupons or other inserts while showcasing your very own design. Conveniently multi-use and offered in many different styles, this unique Jukebox Print product boasts a top tier construction you won't find anywhere else. We love to give you options! 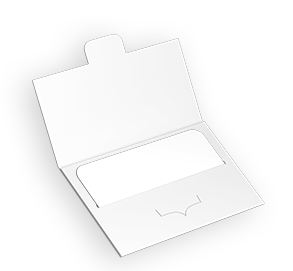 Card holders are available in a variety of eye-catching styles and paper types. Choose from our premium cardstocks and coatings, including our classy Silk Matte Laminate. Gift Card holders take your gifts from ordinary to extraordinary. 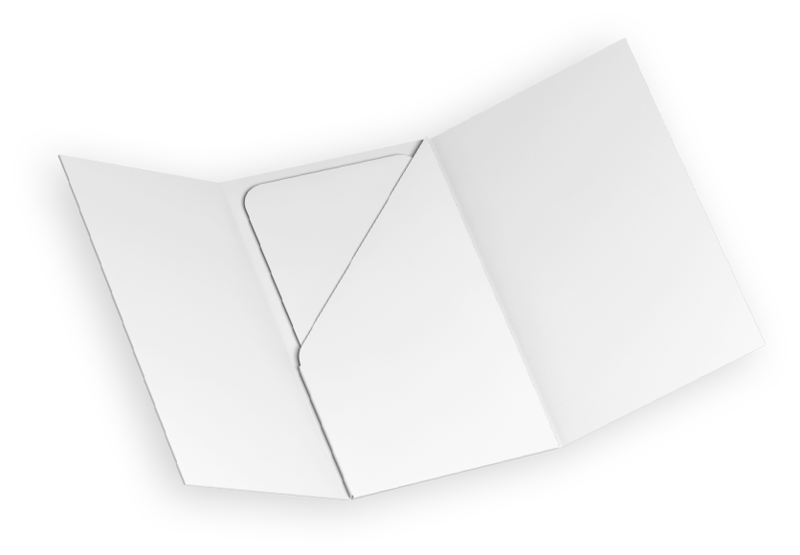 Show your attention to detail by using custom card holders for birthdays, thank-you cards, weddings, or any other occasion. Looking for matching gift cards and holders? Order your coupons, certificates, gift cards or other products from us! Create your products from our wide variety of premium stock and coating options for a fully complementary package. 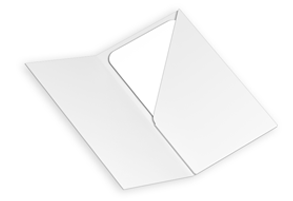 Gift card holder type: Standard Produced on 17pt uncoated bright white with blind embossing. Fancy metallics and all things luxury? Customize your Gift Card Holders with a touch of foil! We offer a wide range of Metallic Foil colours such as gold, silver and rose gold. For those who want a little more dimension, try one of our Holographic Foils! Elegance and sophistication never goes out of style; and you can achieve this with our Pearl Silver Gift Card Holders, available in a sturdy 16pt thickness! Printed colours will look rich and vibrant, and your design will glimmer effortlessly! 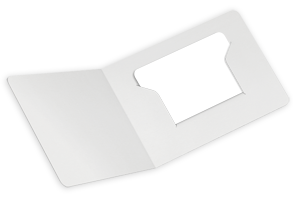 We do offer a thicker 17pt 100% Recycled Smooth Uncoated stock for Gift Card Holders. This will be most suitable for holders that do not require as much assembly, such as the Angular Slits style holder. The three holders that require the most assembly are the Boutique Pouch, Diagonal Pouch and Luggage Tag Pouch. 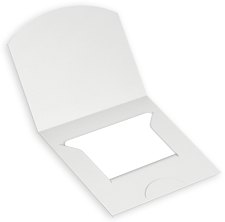 We recommend to choose the 12pt Uncoated instead of the 17pt Uncoated for the best results on these holders. 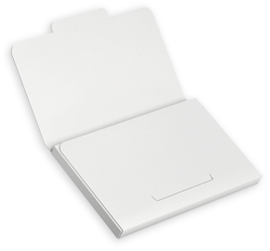 The new Classic Holder is recommended with thin stocks only, such as the 10pt stock option. 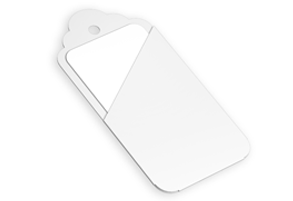 We offer many styles of Gift Card Holders. Most of these involve folding and / or some assembly. As such, thinner cardstocks within the 10pt -16pt range tend to work best. Gift Card Holders in textured Pulp stock are available to order by Print Quote request. 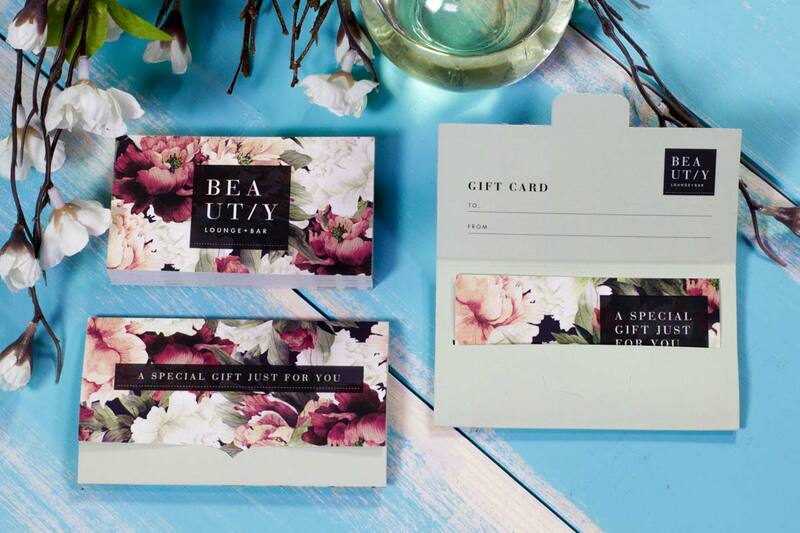 The gorgeous visible texture of this paper makes for the most unique gift card holders, and at 90% recycled content, this stock is a great choice for any business with ties to nature. You can choose from any of our gift card holder styles in combination with this paper. Submit a Print Quote request for pricing and ordering. with comments requesting the Gift Card Holder samples. Samples are also available at our locations. 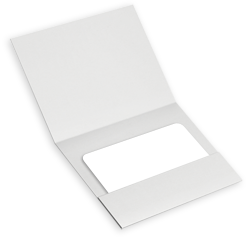 Please request a Speciality Sample Pack with comments requesting the Gift Card Holder samples. Samples are also available at our locations. 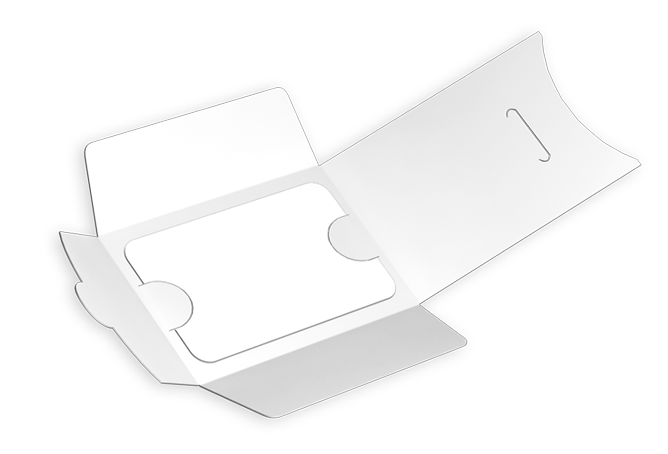 Yes, assembly is included in the pricing of your Gift Card Holders – such as folding and glueing. Yes! These option are all available. 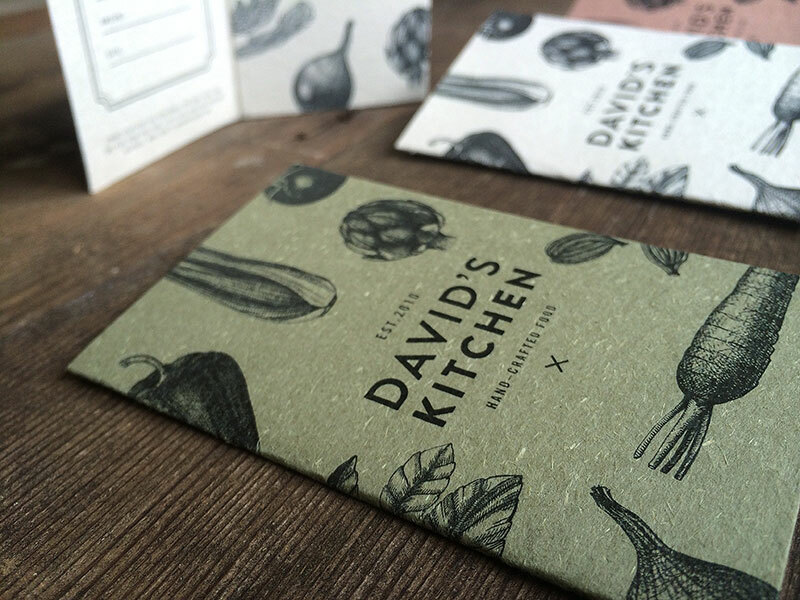 For an extra special finish, you can also add embossing, spot uv, foil stamping or other speciality print finishes – request a Print Quote for these products. Another option is our Digital Output Cards (dynamically printed with a barcode). 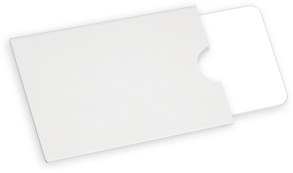 Currently we are not able to offer magnetic strip cards. 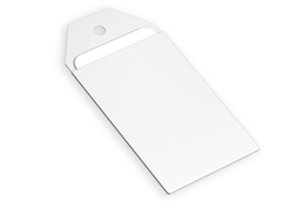 We print Plastic Business Cards which are suitable for using as gift cards. request. Please note that a die-line file will need to be supplied by the customer, and die-creation fees will be incurred for the first order. If you are not able to create the file for the custom holder you can enlist our Design Services at additional cost. 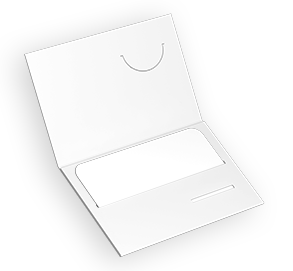 For a more cost effective option, choose one of our pre-made gift card holder templates. 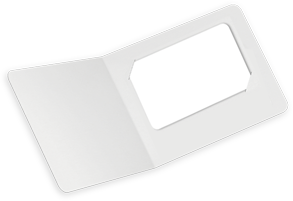 We can create a gift card holder in your custom shape through a Print Quote request. Please note that a die-line file will need to be supplied by the customer, and die-creation fees will be incurred for the first order. If you need a custom size holder, please see the FAQ below. 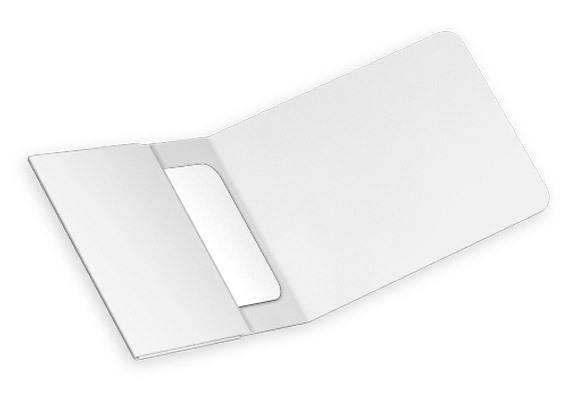 Our Gift Card Holders are designed for standard size gift cards (credit card size) or Business Card size 3.5" x 2". 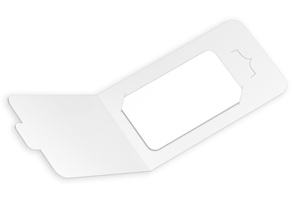 We recommend testing the Gift Card holder you are ordering fits your Gift Card before ordering. Angular Slits - 4.5" x 3.5"Arced - 3.75" x 2.375"Asymmetrical Fold Over - 3" x 5.2"Boutique Tag Pouch - 2.4" x 4.8"Diagonal Pouch - 2.25" x 3.75"Tri-Fold Diagonal Pouch - 3.75" x 2.25"Half Fold Circle - 4.25" x 3.5"Half Fold Pouch - 4.7" x 3.25"Hugging Slits - 5.25" x 3.5"Luggage Tag Pouch - 2.25" x 4.35"Minibox - 3.65" x 2.3"Standard Holder - 2.24" x 3.55"Classic - 3.75" x 2.75"Tri-fold Insert - 4" x 2.38"Tri-fold Tuck - 4" x 2.38"Tucking Pouch - 3.813" x 2.438"